1 Must apply by June 2, 2019. To receive the 5,000 TD Rewards Points to the TD Rewards Visa Account (“Account”), you must keep your Account open, active and in good standing for 90 days after Account opening. If you have opened an Account in the last 6 months, you will not be eligible for this offer. We reserve the right to limit the number of Accounts opened by any one person. Offer may be changed, withdrawn or extended at any time and cannot be combined with any other offer unless otherwise indicated. 2 Earn 2 TD Rewards Points ("Grocery Rebate") for every $1 in Purchases of groceries or grocery items ("Grocery Purchases") charged to your TD Rewards Visa Card Account ("Account") and earn 2 TD Rewards Points ("Restaurant Rebate") for every $1 in Purchases at restaurants including fast food restaurants ("Restaurant Purchases") charged to your Account. Any returned items, refunds, rebates or other similar credits will reduce or cancel the TD Rewards Points earned on the original Grocery Purchase or Restaurant Purchase, as applicable. Fees, Cash Advances (including Balance Transfers, Cash-Like Transactions and TD Visa Cheques), interest charges, optional service, refunds, rebates or other similar credits do not earn TD Rewards Points. $5,000 Cap: Each of the Grocery Rebate and the Restaurant Rebate is only available to a $5,000 maximum net annual spend ("$5,000 Cap"). Once the $5,000 Cap has been reached for either Grocery Purchases or Restaurant Purchases, then any further Grocery Purchases and Restaurant Purchases made on the Account will earn TD Rewards Points at the standard rebate rate of 1 TD Rewards Point that applies to all other Purchases on the Account as set out in your Cardholder Agreement ("Standard Rebate"). Applicability of Grocery Rebate and Restaurant Rebate: Each of the Grocery Rebate and the Restaurant Rebate is in place of, and not in addition to, the Standard Rebate. Merchant Category Codes: To earn the Grocery Rebate and/or the Restaurant Rebate, the Grocery Purchases and /or Restaurant Purchases must be made at merchants classified through the Visa network with a Merchant Category Code ("MCC") that identifies them in the "grocery", "restaurant" or "fast food" category. Some merchants may (i) sell groceries or grocery items; (ii) provide restaurant service or sell fast food; or (iii) have separate merchants located on their premises that also sell groceries or grocery items, or provide restaurant service or sell fast food; but may not be classified with a grocery, restaurant or fast food MCC and such Purchases will not earn the Grocery Rebate or Restaurant Rebate, as applicable. If you have questions about the MCC that applies to a Purchase, contact TD at 1-800-983-8472. Other Conditions: Offer may be changed, withdrawn or extended at any time and cannot be combined with any other offer. 3 Earn 2 TD Rewards Points ("PAP Rebate") on each $1 in payments made on a monthly or other regularly recurring basis for merchant bills, including insurance premiums, magazine/newspaper/online streaming subscriptions, membership fees and telecommunication fees, that are set up by the merchant with your consent to be automatically charged to your TD Rewards Visa Card Account ("Account") and that are classified through the Visa network as "recurring payments" ("Pre-Authorized Payments"). You must confirm with your merchant if they can accept Pre-Authorized Payments. Any returned items, refunds, rebates or other similar credits will reduce or cancel the TD Rewards Points earned on the original Pre-Authorized Payment. Fees, Cash Advances (including Balance Transfers, Cash-Like Transactions and TD Visa Cheques), interest charges, optional service, refunds, rebates or other similar credits do not earn TD Rewards Points. $5,000 Cap: The PAP Rebate is only available to a $5,000 maximum net annual spend ("$5,000 Cap"). Once the $5,000 Cap has been reached, then any further Pre-Authorized Payments made on the Account will only earn TD Rewards Points at the standard rebate rate of 1 TD Rewards Point that applies to all other Purchases on the Account as set out in your Cardholder Agreement ("Standard Rebate"). Applicability of PAP Rebate: The PAP Rebate is in place of, and not in addition to, the Standard Rebate. Other Conditions: Offer may be changed, withdrawn or extended at any time and cannot be combined with any other offer. 4 Earn 3 TD Rewards Points for every $1 in Purchases of travel made online through Expedia For TD ("Online Travel Purchases") and charged to your TD Rewards Visa Card Account ("Account"). Any returned items, refunds, rebates or other similar credits will reduce or cancel the TD Rewards Points earned on the original Online Travel Purchase. Fees, Cash Advances (including Balance Transfers, Cash-Like Transactions and TD Visa Cheques), interest charges, optional service, refunds, rebates or other similar credits do not earn TD Rewards Points. Other Conditions: Offer may be changed, withdrawn or extended at any time and cannot be combined with any other offer. Earn 2 TD Rewards Points for every $1 in Purchases of travel made by phone through Expedia For TD ("Phone Travel Purchases") and charged to your TD Rewards Visa Card Account ("Account"). Any returned items, refunds, rebates or other similar credits will reduce or cancel the TD Rewards Points earned on the original Phone Travel Purchase. Fees, Cash Advances (including Balance Transfers, Cash-Like Transactions and TD Visa Cheques), interest charges, optional service, refunds, rebates or other similar credits do not earn TD Rewards Points. Other Conditions: Offer may be changed, withdrawn or extended at any time and cannot be combined with any other offer. 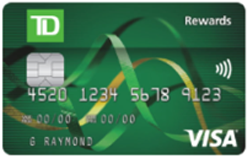 5 Earn 1 TD Rewards Point ("Standard Rebate") on every $1 on all other Purchases ("Other Purchases") charged to your TD Rewards Visa Card Account ("Account"). Any returned items, refunds, rebates or other similar credits will reduce or cancel the TD Rewards Points earned on the original Purchase. Fees, Cash Advances (including Balance Transfers, Cash-Like Transactions and TD Visa Cheques), interest charges, optional service, refunds, rebates or other similar credits do not earn TD Rewards Points. Other Conditions: Offer may be changed, withdrawn or extended at any time and cannot be combined with any other offer. Receive 5,000 TD Rewards Points when you keep your Account open, active and in good standing for 90 days after Account opening1. This offer is not available for residents of Quebec. For Quebec residents, please click here. Earn 2 TD Rewards Points for every $1 in grocery, restaurant and fast food purchases, and regularly recurring bill payments. Flexibility to use your TD Rewards Points on what you want – gift cards, merchandise, travel and more.